Want to start the morning with a reinvigorating shot of espresso without having to wait in line at a café? Buy an espresso machine to make coffee at home just the way you like it. It’s also a good way to save money you spend at Starbucks. Most espresso machines don’t cost that much. The best espresso machine under 200, the De’Longhi cappuccino maker, affordable and worth the money! De’Longhi is one of the best known names in the coffee maker industry. Therefore, it is no surprise that the EC155 can be considered the best espresso machine under 200. It is affordable, easy to use, and offers you a two-in-one function. What more could you need? Let’s take a further look at what this machine has to offer. The De’Longhi EC155 is compact and will not take up too much space in your kitchen. There are a couple of design aspects that really kick this espresso maker up a notch. First, you have got a durable machine. It is made from stainless steel and plastic and like most De’Longhi products will last you for years. Then, you also have a removable water tank, making it easy to get the right level before making your espresso. There are also two, separate thermostats. These are so that you can control the temperature of the water and the steam independent of one another. Another useful element is the built-in tamper which is quite useful when you are using loose grounds to make your espresso. This machine is quite easy to clean as well, in part, because of the removable drip tray. The controls on this espresso machine are incredibly simple to master. You can control the entire functioning of the EC155 by manipulating a knob on the machine. The EC155 is a beginner’s espresso machine. This means that its chief feature is just how easy it is for a novice to use as well. It is as simple as preheating the machine, placing the tamped portafilter in the machine and simply get to brewing. This is not an automatic machine so you will have to stop the brewing once the cup has been filled. With the EC155, you can choose to use either espresso powder or pods as the machine is compatible with both. This is thanks to the dual function filter holder. It is quite impressive that it boasts a 15 bar pump for such a low price. This means that each espresso you make is as delicious as the last. You also get the additional benefit of having some excellent crema settling on top of your espresso. You can make up to two shots of espresso at a time with this machine. If you are hoping to make a cappuccino or a latte, you are in luck. This machine comes with its very own manual steamer and frother. Although they are not ideal, they do help to get the job done when it comes to creating delicious coffee drinks. If you want an espresso machine that offers good, consistent quality without costing a lot then this is certainly the one for you. Each day, you will be able to easily make a great tasting espresso with minimal fuss and cleanup. Most people are well acquainted with the Mr. Coffee range of coffee makers. With this three in one coffee system, the brand has decided to step it up a notch. In addition to making espresso, this machine is also capable of creating lattes and cappuccinos. Read on to discover if this machine has managed to exceed expectations regarding what it can do. Considering all of its components, this Mr. Coffee system is actually quite small. Therefore, you don’t have to worry about it taking up more space than necessary. This machine comes equipped with both a water and milk reservoir. These can each be detached from the machine which makes filling them up a lot easier to do. The cup tray on this Mr. Coffee system is adjustable. This means that you can change the height to fit a variety of cups and mugs. The setup of the machine is quite modern. There is a set of buttons that you have to press depending on the type of drink that you want. The milk steamer and frother accompanying the machine is fully automatic. To make espressos, the machine comes equipped with both a single shot as well as a double shot filter. You also get a measuring scoop and tamper when you purchase this system. There is a removable drip catcher which makes the overall cleanup easier to complete. The features on this Mr. Coffee system is what makes it such a delight. First of all, there is the one-touch setup. Depending on the type of coffee that you want, you just press a button and wait for the drink to be made. You get to choose whether you want single or double shots of the drink as well. One of the reasons that this system is a good espresso maker is the pressure that it can produce. This machine can create 15 bars of pressure which is typically what is required to create a good quality espresso. You also get an external tamper so that you can exert precisely the right amount of force on the coffee grinds. One of the highlights of this maker is the automatic frother. You can choose whether you want to set it to cappuccino or latte. This will give you the perfect amount of milk for that drink. In terms of ease, you will be hard-pressed to find a machine that is easier to use than this. One of the other advantages is that you can actually make a wide variety of drinks with this machine. Regardless of what hot coffee drink you are in the mood for, you will be able to whip it up with the Mr. Coffee model. It should be noted that this Mr. Coffee system is a strictly entry level espresso maker. Nonetheless, it does an admirable job of creating the best cup of coffee for you. Not only that, you also get plenty of opportunity to get creative with your drinks. 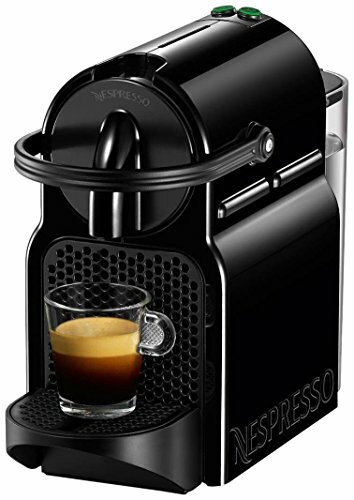 The Nespresso Inissia espresso maker is a good buy for those who want a more modern take on espresso making. It is quick, simple, and creates less mess than most conventional machines. If you are looking to move onto coffee pods and give this fully automatic machine a try, see how well it does here. It cannot be stressed enough just how small the Nespresso Inissia actually is. It weighs just 2.4 kilos and can even be carried around with you, if you choose. It is great for those who either don’t have a lot of kitchen space or enjoy having a portable espresso maker. There are just two main components to this machine. The first is the water reservoir, it can be removed, to make it that much simpler to fill the water up. The other part is the area where the coffee pod is inserted into the machine. By pulling upwards on the lever, the compartment is revealed and is closed when it pushed down again. You can dispose of the pod by using the same motion once the coffee has been made. There are just two buttons available on this machine. The drip tray can be folded up or out, depending on the size of the cup that you want to use. There is almost no learning curve involved with the Nespresso Inissia. One of the reasons is that there are a minimal number of buttons. You can press either button to power up the machine. The two buttons also indicate the type of coffee that can be made. You can choose between making an espresso or a lungo. With the lungo, there is simply more water added to the initial espresso drink. The machine automatically powers off once it has been unused for nine minutes or more. This is great for those who are looking for equipment that are energy savers. Perhaps what truly stands out about this machine is that it can produce up to 19 bars of pressure! This is much more than any of the above machines. Despite its compact nature, you can actually make up to about nine coffees before you have to refill the water reservoir. Also, the preheat time on this machine is only about half a minute. A cup of espresso can also be made quite quickly with the Nespresso Inissia. It should be noted that this machine only takes coffee pods – those that either made from Nespresso or other coffee pod companies. As a result, it is traditionally more expensive than the grinds used with traditional espresso machines. If you want to make your mornings a little more hassle-free, then the Nespresso Inissia is a good way to go. In just a matter of minutes, you will be able to enjoy the drink of your choosing. You can also be a hundred percent certain that you will get the same results over and over again. There is no school like the old school. 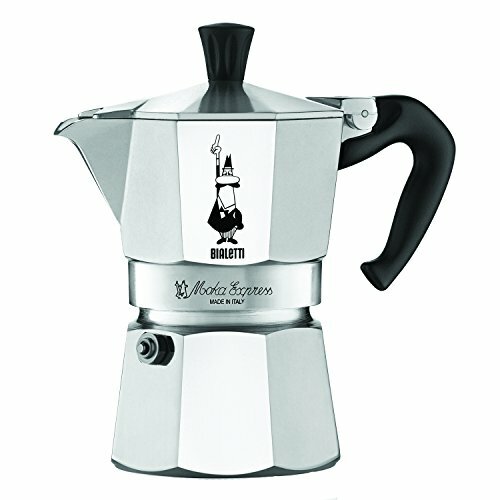 Nowhere is this truer than with the Original Bialetti Moka Express that was actually made in Italy. Unlike modern technology, this moka pot must be placed on a stove, which is where your espresso is made. Yet another reason to like this Bialetti moka pot is the fact that it is also one of the cheapest items on this list. This Moka pot consists of three chambers. The first is the base. This is where you place the water and it is the part that is closest to the flame. The next component is the filter basket which sits atop the base. It is here that you will place the tamped espresso powder. The top most part of the Moka pot contains a filter at the bottom. What happens here is that when the water heats up, it is pushed through the filter basket. Finally, it settles in the upper chamber. This chamber also helps to maintain the pressure that is needed to create a good tasting espresso. The lid can be secured tightly to ensure that none of the hot liquid spills out. The pot is made from high-grade aluminum which ensures that it can be used frequently and incur no damage. There is a reason behind why the pot has an eight-sided shape. This is to make sure that the heat evenly dissipates through the compartment. There is a plastic handle that allows you to handle the moka pot even when it is hot. Making espresso in the Bialetti Moka Express is a manual process. As a result, there are no buttons or levers involved in it. 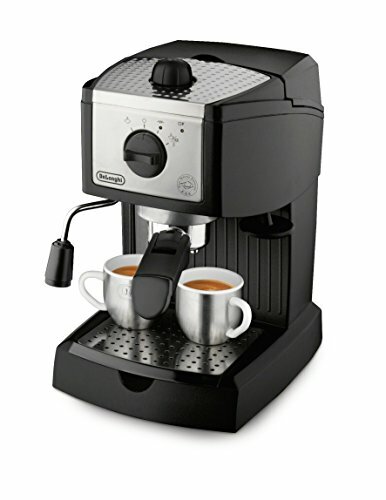 Nonetheless, there are several features that ensure it produces a great cup of espresso. One of these is the valve that is attached to the base of the pot. If the pressure in the pot ever gets too high, this valve automatically opens to relieve this pressure. Then, you have the rubber gasket that is at the bottom of the topmost chamber which helps to preserve the pressure within the pot. This is especially important as there is no pump like in automatic espresso machines. This is also a great pot if you are looking to make several espressos. It is capable of producing up to 3 espressos, with the boiler being able to hold up to 200ml of water. There is no denying that this Moka pot may not be the easiest item to use on this list. It requires a bit of setup, time, and patience. Not to mention, you will have to learn to tweak your espresso making skills as you learn how to use the pot better. That being said, it still produces a good, authentic cup of espresso. It also produces the perfect amount of coffee to either kick start your morning or to perk you up during the day. The coffee craze has been sweeping the world for a while now. This means that people are demanding quality espresso not just at home but also when they are on the go. If you are looking for a portable, easy to use espresso machine, then you should take a closer look at the Staresso espresso coffee maker. It has actually won awards for its innovative design. So, what does this award winning design consist of? Well, there are a rather lot of working parts as it is a portable espresso maker. Nonetheless, they all have a role to play and are fairly easy to assemble. The base of the espresso maker consists of a small espresso glass covered by a grey frame. Above that is the compartment that contains the tamped coffee powder for your drink. This is attached to the base. After that the compartment that contains the water is filled up and then attached to the filter containing the coffee. On the very top, there is the pump which can be unlocked. This is what is used to create the pressure and eject the espresso out into the cup. The maker is largely composed of strong ABS plastic and stainless steel and the whole machine weighs less than half a kilo. The sleekness of the maker as well as its low weight, makes it the perfect piece of equipment for you to carry when you are on the move. According to the company, the maker is capable of producing between 15 and 20 bars of pressure. This is achieved with the help of the impressive stainless steel, hand-powered pump. This means that although it is powered by hand, this maker is able to create more than enough force to make a delicious espresso. You also get a delightful crema on top as well. The fact that this maker is capable of creating a delicious espresso should be enough but it is in fact, able to do a lot more. For instance, once the espresso has been made, you can add milk to the water reservoir and using the same mechanism, make a cappuccino! You can even make cold brew coffee using this maker if you just swap out the hot water for iced water. This cold brew coffee can be made in a matter of minutes – much shorter than most other techniques. As this maker can easily be pulled apart, cleaning it is actually quite easy although you have to wash everything by hand. The only downsides to this maker is that the hot water must be made separately and then added to the Staresso. 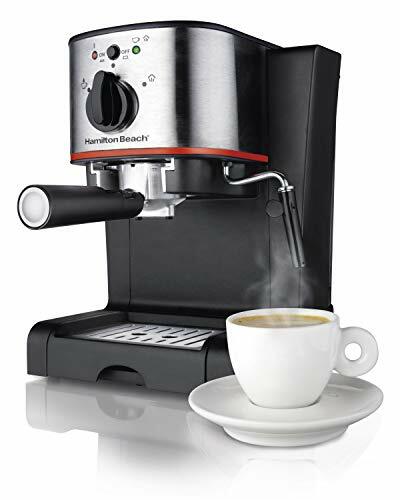 If you are looking for an espresso maker that is similar to those found in commercial coffees, then the Hamilton Beach espresso maker is a good option. It has adequate amounts of power, is simple to use and clean, and even looks like an authentic maker. See just how well it holds up against the competition. The Hamilton Beach espresso maker is quite unobtrusive. It has been built to ensure that it can fit in nicely in most kitchens. There just two controls on this maker. The first is a button that turns the machine on and off. The other is a knob control. The settings on this include one for espresso and one for steam. The filter can easily be fitted in and the lever is pulled to secure it to the machine. The water reservoir is actually quite large. Importantly, it can be removed, which makes filling it up so much easier. The drip tray can be removed. Not only does this make for a simpler clean-up process, it also gives you more options. For instance, you can choose to use a smaller espresso cup or a larger mug with this feature. The filter basket can be adjusted allowing you to make an espresso that is either single or double shot. There is a swiveling steam wand that is attached to the machine that can be used for steaming as well as frothing. As there are just a few settings, it is incredibly easy to learn how to use the Hamilton Beach espresso maker. It is simply a matter of filling the filter basket and then slipping it and locking it into the machine. This machine is compatible with both grinds as well as pods. Therefore, you are given just a little bit more choice in what you want to use. There are two indicator lights that help you determine when it is time for your espresso to be made. Once the machine has been heated, a light turns on indicating that it is time to start the process. 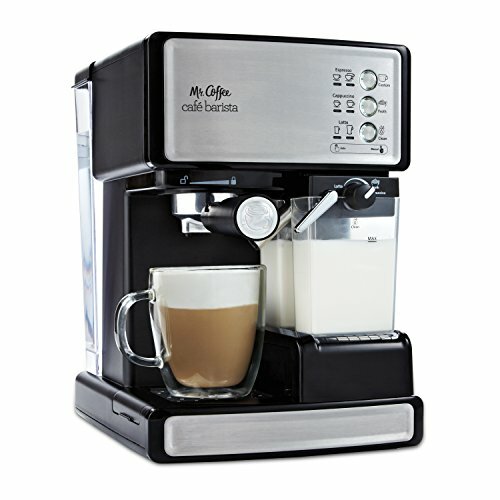 By turning the dial, you can choose whether you want to make espresso or steam milk. The top of this maker actually serves a function. You can place your cup there and have it warmed up for you. This espresso maker utilizes 15 bars of pressure to produce a well-flavored and crema topped espresso. The wand on the side of the machine can be used to make cappuccinos. It helps to warm up as well as froth the milk which you can use to add to your espresso. This is a good entry level espresso machine to purchase. Although it is not without its problems, for the most part, you will find it to be a useful maker that has a variety of functions. The Bella Personal espresso maker looks like a hybrid between a traditional percolator and an espresso maker. Nonetheless, it is quite compact and you will be surprised by just how much this machine is able to produce. Unlike most other espresso makers, the Bella model is equipped with a carafe. This allows you to produce a larger amount of espresso at one time. Instead of a regular handle, the carafe has a straight bar. There is just one knob, located on the side of the machine. The drip tray can be removed when you want to clean it. This espresso maker comes equipped with a built-in steam wand. This too has a removable cover for the purposes of clean up. This espresso maker includes its own personal coffee scoop. This allows you to make more precise measurements instead of having to guess. One of the best features on this espresso machine is just how much you are able to make with it. You can choose to make anywhere from one to four cups of espresso. The gauge present on the carafe helps you to determine the number of cups that are made. It also helps with measuring the water that needs to go into the machine. This espresso machine is also chock-full of safety features. For instance, the unusual handle on the carafe ensures that you will not be burnt as you are handling the container. The spout is also completely drip-free. This way, you don’t have to worry about being scalded by any of the hot liquid. The filter comes equipped with a special safety clip. This ensures that it remains secured to the machine until you are ready to release it. Thanks to the built-in steamer, you can turn that espresso into either a cappuccino or a latte. 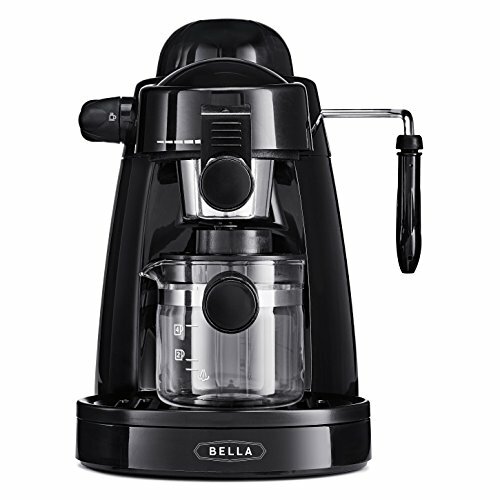 The Bella Personal espresso maker uses 5 bars of pressure. This can be used to create a good cup of espresso. However, it is not necessarily high enough to be considered a high grade espresso maker. The Bella Personal espresso maker is definitely one you should consider if you want to make large amounts of espresso at once. In addition, it can come in quite handy if you want to make other types of coffee-based drinks as well. Make sure all the parts are included when you buy the machine. The above-listed ones include all parts unless otherwise specified. However, some espresso machines may require certain parts that you have to buy separately. Buy an easy to clean espresso machine. Check if the drip tray and milk frother parts are removable for cleaning. You may also want to consider the size of the machine. Most espresso machines are rather compact. But if your kitchen has limited amounts of space, you might want to buy a smaller than average espresso machine. Espresso machines come as fully automatic or manual. Make sure you buy the one you want. Automatic ones are, of course, more convenient to use. However, manual machines do not require much effort either and you can make espresso in a matter of minutes. You might want to pair your espresso machine with a good coffee grinder to make shots straight from beans. Related Guides: How Much Does it Cost to Remodel a Kitchen?